The prize includes bragging rights and a custom plaque for display in the restaurant! Located at 576 Main Street in Oakbank, Cedar & Main is an easy drive from Winnipeg, especially if you&apos;re on the way to Birds Hill Provincial Park this summer! Must try menu items include The Beast (three delicious patties topped with three slices of cheese, three strips of bacon, lettuce and delicious zesty mayo. All served of a fresh brioche bun. ), The Chili Cheese Dog + Bacon (famous Winnipeg Old Country Hot Dog, C&M chili, bacon, diced onions and mustard) and The Boss Burger (Signature creation constructed with 2 patties of delicious ground chuck, two slices of cheddar cheese, zesty mayo, pickles, lettuce and served on a fresh brioche bun). If that doesn&apos;t convince you to make the trip to try this outstanding drive in, just read a few of these reviews from customers and fans! 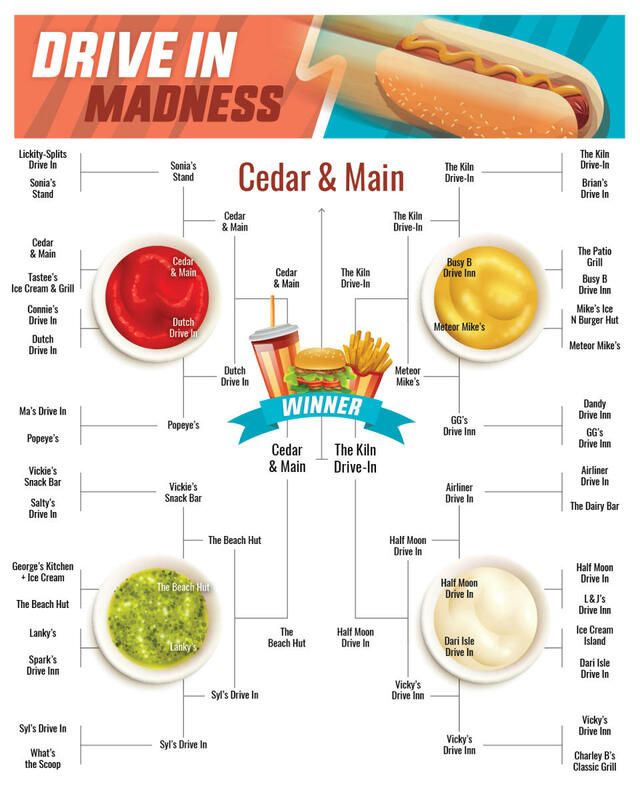 A HUGE THANK YOU to all who campaigned their hearts out, participated and voted in this year&apos;s Drive In Madness! See you next year!